Stretch yourself and discover your strengths. The middle school years can be challenging for any student. At Darlington, we'll equip you with academic and social tools that allow you to dive deeper into more advanced studies, while empowering you to explore and pursue your passions among classmates and teachers who support and uplift you. Gatlin Hancock ('23) is a day student from Rome, Ga. He began his career at Darlington in sixth grade. Hear about Gatlin's experiences in middle school and how he's developing leadership skills through athletics, academics, and service to the community. See what’s new with middle grades students. Check out recent happenings and picture yourself at Darlington. Apr 17Galleries Shakespeare is NOT Boring! Middle grades are just the beginning. 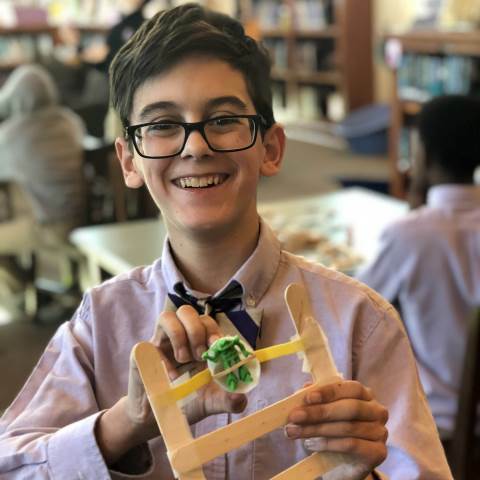 When you complete the middle grades at Darlington School, you'll be confident, creative, and prepared for an exceptional high school experience. You'll collaborate. You'll think critically. You'll find independence among friends and teachers that care about you. It may be the middle, but it's really only the start of your journey to becoming your best self. At Darlington, academic rigor is embedded within 21st Century learning through collaboration, technology and advanced study. As you grow in your academic pursuits, you'll find yourself more than prepared for the future, but dedicated to making a difference. Our admission team makes beginning life as a Darlington student simple and seamless.